Summit Express offers a variety of airport vacation transportation, including scheduled airport shuttles private charter rentals and group special event transportation. Summit Express offers scheduled shuttle service to and from Denver International Airport and all the ski resorts in Summit County Colorado. The professional drivers will take you to your Summit County destination door stop whether it is in Breckenridge, Keystone, Copper Mountain, Dillon, Silverthorne, Frisco, Vail or Beaver Creek so you can start your Colorado vacation hassle and worry free. If Summit County is your home, drivers will gladly take you safely to DIA and back home to your physical address. Shuttle service is available for one way or round trip with drop offs and pick ups available at any location in Summit County. 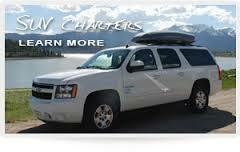 Charter service is available for all locations within Summit and Eagle Counties. One coupon per person; No Transfer Station. Must mention WhatToDo coupon when making reservation.